Swimtrainer Classic by FREDS SWIM ACADEMY GmbH WINS the Gold Award at Family Review Center! FREDS SWIM ACADEMY GmbH has earned a Gold Award for their amazing Swimtrainer Classic! Jan. 29, 2013 - PRLog -- Phoenix, AZ - Family Review Center was proud to announce today that the coveted Gold Award has been awarded to FREDS SWIM ACADEMY GmbH for their Swimtrainer Classic. The advantages of the Swimtrainer Classic device are: it is for babies from 3 months on up to 4 years old. 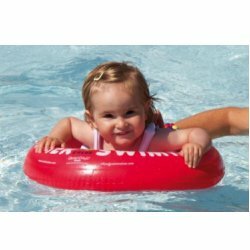 It offers a perfect swimming position with no sliding through dangers or problems with tipping over. It is also very quick and easy to put on, so it is used consistently rather than tossed aside as a bother. This is a great way to teach children swimming technique in a safe way that they will not mind. It has been developed with a child's safety and comfort in mind. It is also a mind easing product for parents, as they know their child is safe when it is in use. However, we must stress, as with any swimming / water device, never leave a child in water unattended. There is no safety in solo water adventures for children, no matter what safety device is used. Congratulations once again to FREDS SWIM ACADEMY GmbH We think you are pretty awesome!